Versatile Standard Wire-Haired Dachshunds in Langley, BC, Canada. The Wire-Haired Dachshund is a member of the hound group known for hunting above and below ground. They are a small, low dog with a keen sense of smell. They are healthy, active dogs with a great sense of humour. We pride ourselves in running a small, quality kennel that keeps very few dogs at a time on our premises. 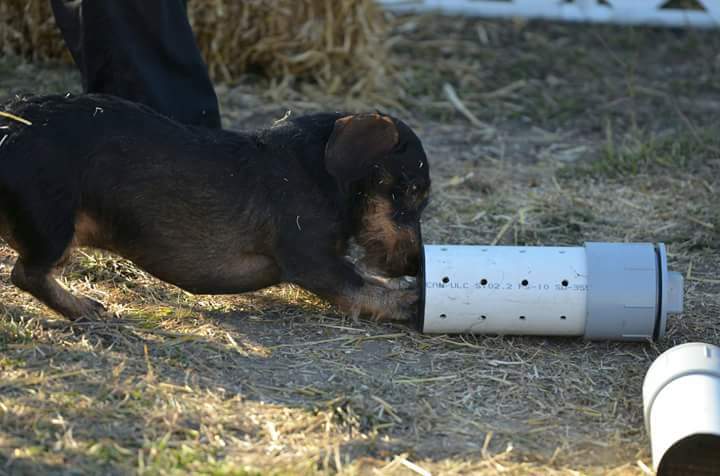 We have been very fortunate to work with 2 other fanciers to ensure excellence, and genetic variation in our Dachshunds. This has allowed us to exhibit several dogs since 1984, having produced over 25 Standard Wire-Haired Champions, and several dogs gaining performance titles. Qualified to judge all levels of Earthdog and Dachshund Field Trials. Life member of the Canadian Kennel Club. We expect our dogs to be versatile - we do Earthdog tests, Field Trials, Bloodtracking, Obedience, Conformation, Barn Hunt, and enjoy them as loyal companions foremost.